My Fifth and Last Stop.. the Old Penang Town.. It was a rainy morning. The minivan was on time, 6 o’clock sharp. I shared it with other 6-7 passengers and 2 of them were friends I hangout with in Haad Rin and Koh Samui. After an hour ride and few stops made to pick up other passengers, we arrived in Nathon pier where we would take our ferry to Surathani. We were given the ferry ticket and a sticker with our destination written on it eg. mine was Penang. The ferry to Surathani is really big, bigger than other ferries I took on this trip. Unfortunately I was so tired to take a picture so I spent the time to sleep till reaching Donsak pier, Surathani. From Donsak, we were directed to take a bus, a big one, but it was full. So we waited for another bus about an hour and were dropped at the travel agent in Surathani. Then again, another one hour waiting in the agent, which I used to have a lunch. Then we continued the journey by minivan with few stops made along the way to pick up other passengers, and in souvenir shop and passenger registration in Hatyai. Then an hour later, we arrived in immigration and continued the ride for another 2-3 hours and finally we reached Penang. They dropped us at Banana Guesthouse, opposite to Love Lane, the alley to my guesthouse. 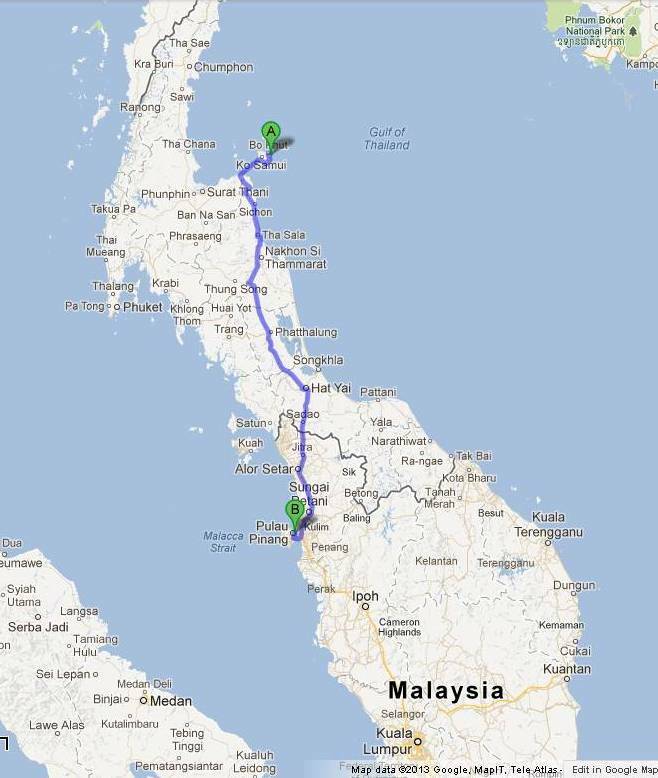 It was really a long journey from Koh Samui to Penang (about 15 hours). Lucky I had friends to talk to along the way but we had to say goodbye that nite cause I had to go back home the next day. Penang looks like a big city, though in my hostel neighborhood, it looks old town with British/Dutch building nearby. That time was still on Chinese New year celebration. I saw Chinese lampions decorated along Love Lane. I check-in at Old Penang Guesthouse around 10pm. The front desk was kind and helpful. I wanted to take a bus to catch my morning flight but then decided to go by taxi instead. I was exhausted. He helped me arranging it for RM45. When I entered my room, I was so happy to find out that it was very clean. I shared it with other 3 female travelers. I used my time that nite to go around Love Lane area and tried some street food. For me, Malaysian food tastes good, better than Thai for sure :p I found a noodle stall in front of Chrystal Inn. Tried their original Suikiau mee and tasted so so. Then I found this Old Trafford Burger stall which is delicious according to their review from other blog. I ordered their hotdog with egg for take-away. I made my last stop at 7eleven, in the corner of Love Lane, to buy some souvenirs include Old Penang Tea / Teh Tarik which tasted good. I wish I had bought more. Time passed by so fast. It passed midnight when I was back at my guesthouse. I started cleaning up and packed my stuffs. Their bathroom was quite dark but it was clean. Their interior reminds me of old haunted dutch building in Jakarta.. spooky at nite (hihihi). Then I went to their lobby to use their wifi for internet check in but I got no connection (:bummer:). Well, I went for sleep and set up my alarm for 6am. Silly me, the alarm I set up was still in Thailand time (an hour before). Fortunately the front desk managed to wake me up. I was really in the rush cause the time was 6.30am and my flight was 8.50am. So without washing my face and brushing my teeth, I took off to the Airport. Their front officer made all check out process like a flash then I arrived airport around 7.30. I went straight to Air Asia check in desk with a long queue. My flight supposedly departed at 5pm when I booked it few months before. 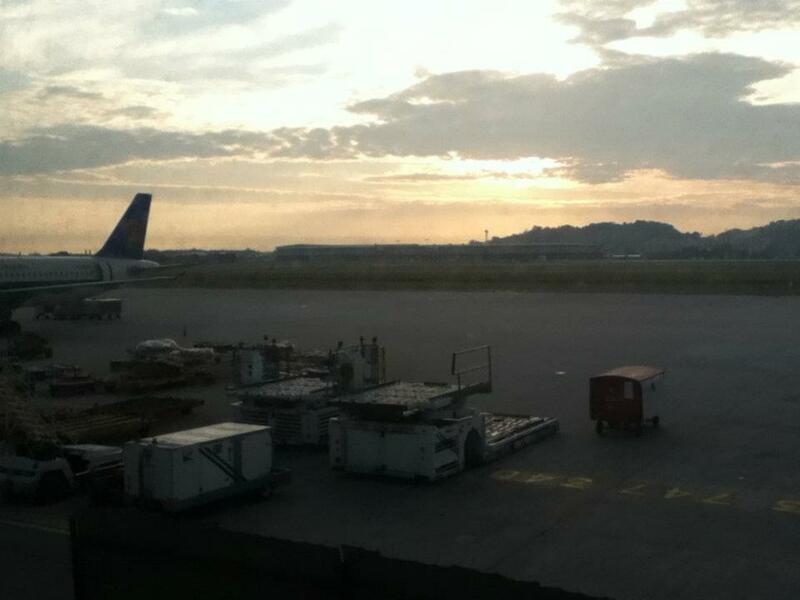 But a month before my departure, they changed their schedule to morning flight. So be careful if you reserved this airlines few months prior, you may get your schedule changed. Phuket International Airport was under construction that day. I had to cancel my plan to find other souvenirs cause limited time I had. The airport is nice, many restaurants near check in area. But I had my breakfast in their waiting room, eating the Old Trafford Hot Dog. It’s YUMMY!!! Then I proceeded to immigration. I could see many renovation inside. Ow.. there were some Tshirt shop near the boarding lounge. I bought a Tshirt for Rm30. I never thought I would have the feeling that my journey ended so fast. It felt like I just started it a day before. Well, I guess most travelers would feel the same way on the last day of their trip. I thank God that mine went smoothly. I really had good times exploring those islands in Thailand, hanging out with travelers, meeting new friends on the road. Although I had to admit that I couldn’t wait to go back home, sleep in my bed and eat Indonesian food again LoL. I miss my home. Old Trafford Burger Hot Dog + Egg ; RM 7, it’s across Banana guesthouse and 7eleven. Their burger and hotdog served in big size ^^ . Yummy! !